Your conversion rate is a percentage, or number of viewers on your website who go on to make a purchase from your business. For most businesses, this is one of the most important part of having a website. After all, we want an exponential ROI on the website. A common misconception among most people is that “if there are more people coming to the website, the more sales we’ll make”. Although this statement is mostly true – it isn’t completely. 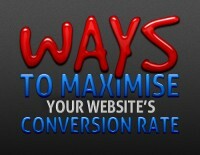 Instead of attempting to solely increase visitor numbers, we want to focus on our conversion rate with the current ones – if our current conversion rate is poor, why would it automatically improve with more visitors? Don’t make users think; do the job for them. We want to make the user’s life easy. Ensure your website is cleanly designed. Make sure your content is consistently set out, is easy to read and makes sense. Cut out everything that isn’t absolutely necessary – we don’t have time (or the attention span) to read it all. Help customers trust you and what you’re trying to provide for them. Be as transparent as you can in the operation of your business and the process of them receiving their product or service. Use trust logos (VeriSign Secured) to help customers feel secure. Let them know of all expenses – don’t advertise a product for $20, when there is a $50 postage fee. Give the visitor something to remember – the first impression is always the most important. Create an experience that will be memorable and will make that viewer a reason and a desire to investigate further. A good design gives a professional feeling and you’ll find that the extra money you spend on a professional design will be returned with the extra sales you make. Ensure you’re including vital (but simple) advice and information on your products and services. If you’d like to know more about this topic – here are a few handy links that might interest you.